One of the most coveted pieces of Fiestaware is what collectors call the “Unlisted Salad Bowl”. 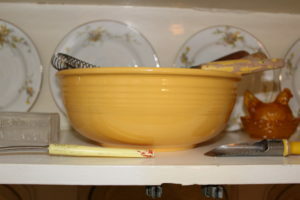 It isn’t on any of Homer Laughlin’s price lists, but an ad from 1940 offers the bowl with matching salad spoon and fork for $1.00 and listed the color as yellow. This is a difficult piece to find, and even harder in other reported colors of ivory, red, and dark blue. My Unlisted Salad Bowl was a lucky find at a local thrift store. It is now in my kitchen’s display cabinet, taking center stage! The coveted Fiesta Unlisted Salad Bowl.